A derelict mostly subterranean temple dedicated to the patron goddess of executioners, flagellants and torturers may not be high on a list of tourist destinations, but there are potential rich pickings for intrepid adventurers. The backstory reveals how decadent society prized the misfit devotees of this cult, while city authorities found them... useful. It also tells of the destruction of the temple by those who prized light and beauty and life, and found the cultists' obsession with death so abhorrent that the only solution was to put them to the sword. There are plenty of rumours that the party can collect merely by strolling through the nearby Bazaar of the Gods. Some of them even contain a grain of truth. The adventure proper, however, begins with the acquisition (by fair means or foul) of a map that porports to show the way in through the shattered remains of the temple to an unknown passage that leads deep underground. Armed with that, it's up to the party to decide if they will pick over the temple first, or plunge headlong into the depths at once. There's not so much to see above ground however. Below it's claustrophobic and seemingly teeming with adversaries, who are carefully orchestrated to come at the party from all directions almost continuously. It soon becomes clear why the Judge is advised to prepare and plan out this adventure before running it. Descriptions are atmospheric and the threats are deadly; yet all are logical and based in the backstory and in the physical surroundings in which the party finds itself. 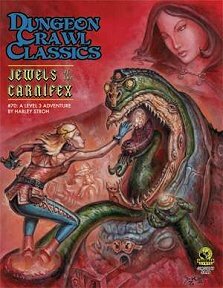 It's an imaginative adventure in which unusually for Dungeon Crawl Classics one adversary does actually try to negotiate with the party... not entirely honestly, to be sure. Detail throughout is stupendous, and even if the party gets away with the loot they then have to figure out what to do with it. Definitely recommended! Return to Jewels of the Carnifex page.